ST. GEORGE, Staten Island (WABC) -- Eyewitness News got an exclusive first look at construction as the first major parts of a giant Ferris wheel on Staten Island's waterfront arrived in New York City. 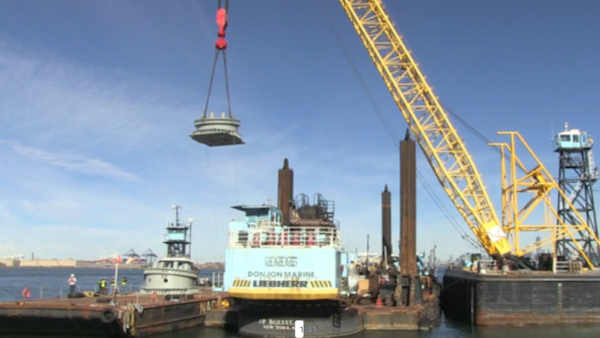 The four pedestals for the 'New York Wheel' left Canada last week and were transported along the Hudson River to their final home on Staten Island. Each of the wheel's four pedestals weighs approximately 100 tons and is 18 feet in diameter. They are manufactured by ADF Group based outside Montreal, Canada. The pedestals, which will hold the legs of the wheel that recently arrived to Brooklyn, are the first major piece of the wheel to arrive at the site. Opening in spring 2018, the New York Wheel will be the world's tallest observation wheel at 630 feet and is expected to attract more than three million visitors per year. The $590 million project is part of a $1.2 billion redevelopment of Staten Island's North Shore. Eyewitness News got an exclusive look as the first parts of the 'New York Wheel' arrived in New York Harbor.